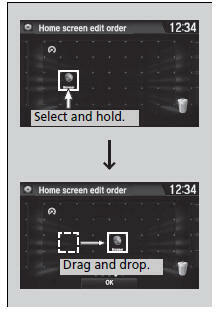 Selecting or , or swiping the screen left or right changes to the next screen. The home screen has 5 pages (fixed). You cannot add any more pages. Select to go directly back to the first page of the home screen from any page. 4. Select the app or widget you want to use. App Installer: Allows you to install apps. Browser: Displays the web browser utilized by smartphone and Wi-Fi connection. Downloads: Displays the data downloaded from the web browser and so on. 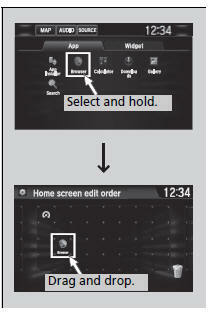 Search: Displays various retrieval screen. Select and hold a selected app or widget to add that app’s or widget’s shortcut on the home screen. Pre-installed apps may not start up normally. If this occurs, you need to reset the system. If you perform Factory Data Reset, it may reset all the settings to their factory default. In case those apps still do not startup normally even after Factory Data Reset, contact your dealer. There is a possibility that a browser is shut down in the situation of the use. In that situation, the screen will return to before the browser startup. You can delete user installed apps by the following procedure. 4. Select the Others tab. 6. Select an app that you want to delete. Pre-installed apps cannot be deleted. App or widget icons can be added on the home screen. 3. Select and hold empty space on the home screen. 5. Select and hold an app or widget icon you want to add. 6. Drag and drop the icon to where you want it to be. You can change location on the home screen. 1. 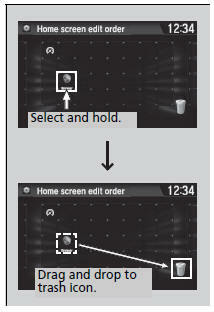 Select and hold an icon. 2. Drag and drop the icon to where you want it to be. You can also move the Phone, Info, Audio, Settings, Navigation*, HondaLink, Smartphone Connection, App List, and Instrument Panel icons in the same manner. You can delete the icons on the home screen. 2. Drag and drop the icon you want to remove to the trash icon. The icon is removed from the home screen. You cannot delete the Phone, Info, Audio, Settings, Navigation*, HondaLink, Smartphone Connection, App List, and Instrument Panel icons. Apps or widgets will not be deleted by deleting the icon on the home screen.